Our team provides excellent service and outstanding product knowledge, so as you browse our extensive range of wallpapers and fabrics, trade and designer paints, decorating sundries and equipment, please do feel free to ask questions. If you can’t find what you need in stock, you can access our online wallpaper and paint selections right here in the showroom, and order it into store. 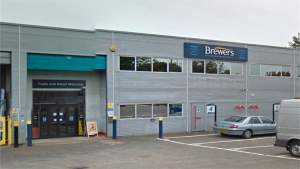 Gillingham Business Park, where you’ll find Brewers Decorator Centre, is about a mile from junction 4 of the M2 motorway, and easily accessed either from the A2 London Road or Hoath Way. We’ve been here for more than 30 years; it’s a handy spot for tradespeople in particular, with Travis Perkins, HSS Hire and Toolstation all in the same block, and there’s lots of parking for vans and cars outside. Travelling down Ambley Road towards Hoath Way, take the first left onto Matilda Close Trade Counter. The store will be on your right.